This thread is for comments about our Lei Shi encounter guide. The protectors don't need to be tanked. Banish, bind elemental, etc will work to CC them. The Animated Protectors can be fully CC'd as well. This means Banish and Bind Elemental is the way to go. She also starts with three adds (10 man) on each Protect and adds a fourth as the fight goes on. Thank you both a lot. Adding the fact that the Animated Protectors can be crowd controlled to the guide right now! 2. Hide ability actually not about blind AoE spamming - you can spot her by standing near her hideout (visual effect, spark, will apear) - then you can AoE that location. So distribute players evenly across platform and ask for call-outs about her location, then AoE. Thanks! Fixing this right now. The enrage timer isn't 6 minutes, it's 10. It really isn't very strict at all. Once the first AoE has hit her, everyone's pets will run to that location (if they've been set on aggressive). So follow the pets. On a healadin aspect I always try to have charges of holy power built up and the cooldown for Light's Hammer available for when Get Away is cast. I drop the hammer on the center where everyone should be attempting to run to in the first place and then cast Light of Dawn to get a raid wide heal out as often as I can. I generally have 4 or 5 charges of holy power saved just for this moment. I spam the light of dawn every cast I can, throw a holy shock to get another charge and then hit light of dawn again. If by then the get away is still going I will cast Holy Radiance to get another charge of holy power and then hit Light of Dawn again for another raid heal. By this point the Get Away is done and I continue topping people off and healing the tanks. As it currently stands, DBM only signals a "Special" incoming, and that "Special" can either be a Hide or a Get Away, but it is entirely random. That randomness saved our asses on the first kill, since 1 tank died in last protector spawn, with no more CR's, and RnG got us 2 "Hide" from 20% to kill, giving the remaining tank the chance to reset stacks. Needless to say us 3 healers just spammed and used all our cd's to keep him up in between specials. As noted above, DBM timers are accurate for the 'Special'. It's either a Get Away or a Hide, but you've no idea which until it occurs. DoT classes may wish to note that in the time between Lei Shi announcing Hide, and actually disappearing, there is enough time to refresh an instant DoT (or for afflocks, all 3 if you want to burn a shard). Generally, you will get a protector phase with ~15 or less seconds to the next special. IF this occurs, when you finish the protector phase, the special timer will re-appear at a 3 second duration after she becomes attackable. This means you will frequently have back to back protector + special phases, which is quite important to know for DPS classes planning CDs. We are now attempting this on Heroic, I'll update some more once I've got start info for that. Any heroic tips? Mainly how to switch for Scary fog etc. 25 man preferred. I only have limited experience so far, and on 10man so it may not be of much use. What I've discovered so far is, it's critical to have the debuff uptime on the boss (and ideally on the protector you choose to DPS) as much as possible. From checking logs and watching vids, guilds doing this well have a player with a reasonable number of stacks (5+, anywhere up to 16 or so) on the boss the moment she becomes attackable. I attempted this with 2 players stacking only, and while we had it roughly nailed down (there wasn't a set rotation order, just whomever had highest stacks at any given time was asked to go in, and we let stacks drop at 10+ to save our healers), I feel that 3 stackers will make life much easier on all of them, and will ensure higher stacks are always available. While that technically constitues higher pressure on the healers (we brought 3 to start), overall it should speed the fight, and in particular Get Away and Protector phases, which represent high raid and tank risk phases respectively. You'll want assigned, quick and focused CC on the protector phase, they hurt even more than usual and will 1-shot any non-plate user. As far as scary fog actually goes itself, it's not so complex as it might seem at first. Anyone outside her 'circle' stacks the fog based on a reliable DBM timer on a ~7 sec cooldown. The debuff lasts 35 seconds, and does 10% per stack. What you need to decide ahead of time is what constitutes 'too high' stacks, and let your stackers know to allow stacks to drop after that point. Apart from that mandate, all of them (I dont know how many you'd need on 25man) should be staying out to build stacks as often as possible (when not directed to be on the boss or protector). You'll want to have one of them monitoring the debuff and making calls to ensure quick swapping and thus high boss-uptime. That might make it sound like you'll end up with all stackers with roughly equal stacks, but in practice you'll end up with it being fairly staggered I believe (again, based on preliminary observations from the 10 or so pulls we had before raid call last week). Warlock's demonic gateway is super handy for any stacker to get in or out quickly, mage's blink, warlocks personal demonic circle, are all very useful ways to get a player on the boss quickly (especially for Get Away phases). The other tanks don't have to worry at all about the adds and can just continue swapping the boss. Because he is stacking the fog the add takes a lot more damage and you can kill him very fast. On the other hand, the tank also takes additional damage so he will have to be very good with his cooldown usage between 'get away' and the add tanking. Your healers will also have to be on point with the healing. I believe the bear used a 5 second stun on the add (and marked it with a skull). In these 5 seconds he built up aggro. Then he used his cooldown to take the damage from the add (together or followed with a sacrifice, monk cocoon or other external cooldown). If the add was still alive when these cooldowns ran out he would start kiting but I'm not sure he had to during our kill. We had 4 marks on the ground for 2 reasons: so people could yell on ventrilo where the boss was hiding (ON RED! BETWEEN BLUE AND GREEN!!...) and to assign CC. 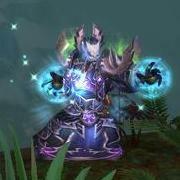 Our Warlocks and shamans were each assigned to a color and had to CC the add that spawned CLOSEST to their color. These adds will go straight for your healers and if you do not take care of them quickly they will get one-shotted. Therefore we were all ready with fears and stuns for the adds that got too close and there were also rings of frost on the ground. We had the raid stack up on one side of the boss, the tanks approximately 120° on the other side of the boss and we had a portal another 120° further so the stackers could get in and out quickly without standing on top of the tanks or the raid. Generally it doesn't matter if the raids gets the debuff except during get away in which case the damage will be almost unhealable. Besides that you just need a healing cooldown cycle for the get away and coordination between healers, tanks and stackers. The stackers would take turns going in without dropping their stacks. I believe we had our DPS stacker go up to 10-12 stacks before staying on the boss for the full 35 seconds and repeating. When we reached 20%, we killed the adds and if there was no special incoming we popped hero, the tank stacker (who by this point has about 35-40 stacks) gets on the boss and we kill it. positioning: stack during get away (but not with the debuff stackers) while you spread out during the hide phase. Good healing on the tanks so they don't die, I believe we used 7 healers on our first kill. It is a pretty easy fight and we managed to kill it in about 10 attempts. After our Heroic kill we found that frost resistance was a viable way for our tanks to survive the splash damage. Today was he first day that one of our tanks tried it to test and we found that he was taking signification less damage. We are probably going to outfit our other tank with it for next week now that we know this works well. And then we put a Void Sphere in every slot. Would you be able to provide some logs or something to back this up? It doesn't sound likely to me since they took out the resistances. While you are correct they took out resistances, gear with resistance and gems still exists as I have shown above. The reason it is viable is because all the damage that Lei Shi does is Frost damage and "Get Away!" is shadow. As you can see our warrior tank took less damage (on a longer fight) with resist gear. While our paladin tank took slightly more on a longer fight.